The Turkish joint venture now builds and exports Transits. 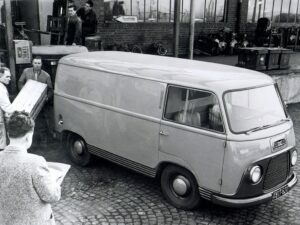 Ford's first pan-European product replaced two unrelated van models in Britain and Germany. Ford Otosan, an automotive joint venture that traces its roots back to industrial pioneers Henry Ford and Vehbi Koç marked its 50th anniversary today with a celebration in Istanbul. During the past five decades, Ford Otosan has been an integral part of Ford Motor Company’s international operations, most recently building successful vehicles such as the Ford Transit, Ford Transit Connect and Cargo commercial vehicles. Koç links to Ford go back eighty years to Henry I. More than 500 guests joined the celebration, including Rahmi M. K Koç, honorary president and chairman of Ford Otosan, Bill Ford, Ford executive chairman, John Fleming, chairman and CEO, Ford of Europe and Lewis Booth, Ford chief financial officer. The celebration also included Turkish federal, state and local government officials and cultural leaders. Ford Otosan is a fully integrated operation, including sales, marketing, engineering, manufacturing and parts distribution. Ford Otosan is a fully integrated operation, including sales, marketing, engineering, manufacturing and parts distribution. Ford Motor Company and the Koç Group each hold a 41% stake in the joint venture with the remaining 18% held publicly on the Istanbul Stock Exchange. It employs about 7,600 employees at its manufacturing operations in Kocaeli and Inönü, its parts distribution center in Kartal and its engineering center in Gebze. Otosan was founded in 1959, and in 1977, the company signed a license agreement with then-Ford Chairman Henry Ford II and the company’s name was changed to Ford Otosan. In 1997, Ford increased its share of ownership to 30% growing to 41% in 1997. Over the past 50 years, Ford Otosan has led the transformation of the Turkish automotive industry. It was the first company to build a Turkish-engineered car in the country – the Anadol. 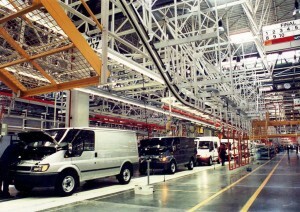 It also was the first – and is still the only – Turkish auto company to export a vehicle to North America, the Ford Transit Connect. Ford Otosan has been the top-selling auto company in the Turkish domestic market for the past eight years. Ford Otosan products are exported from Turkey to more than 60 countries around the world, including markets in Europe, Central Asia, North Africa, the Middle East and North America. Ford Otosan produced 173,000 vehicles in 2009 with worldwide revenues of $3.7 billion. Since the Kocaeli plant opened in 2001, Ford Otosan has become key in Ford’s commercial vehicle production strategy. The combined Kocaeli Plant and Inönü site produce a full range of light, medium and heavy-duty commercial vehicles, including the Transit Connect, Transit and Cargo vehicles. In addition, the Puma Transit engine and Ecotorq Cargo engine are produced at Inönü. “For Ford Motor Company, Ford Otosan represents not only the proud heritage of our past, but the bright promise of our future. It will be exciting to watch that future unfold,” Bill Ford said. This entry was posted on Monday, June 28th, 2010 at and is filed under Automobiles. You can follow any responses to this entry through the RSS 2.0 feed. Both comments and pings are currently closed.